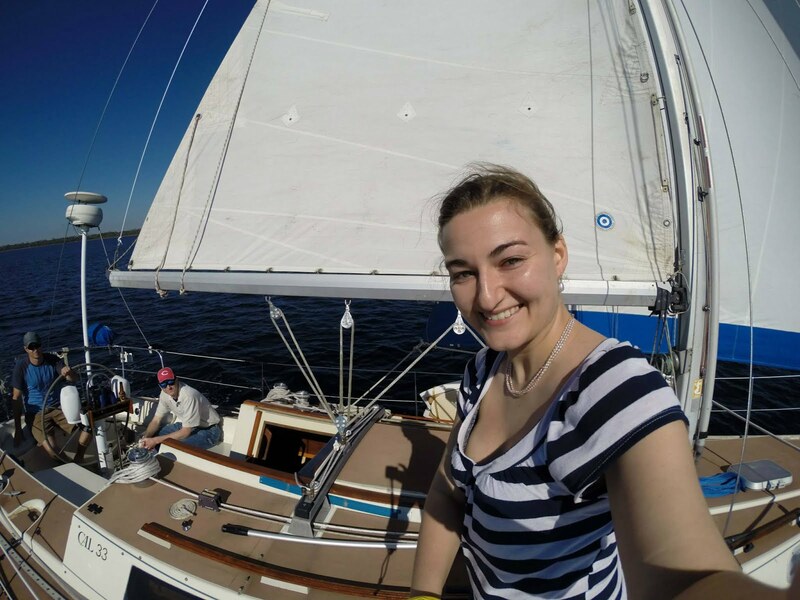 This past week was my Spring Break! 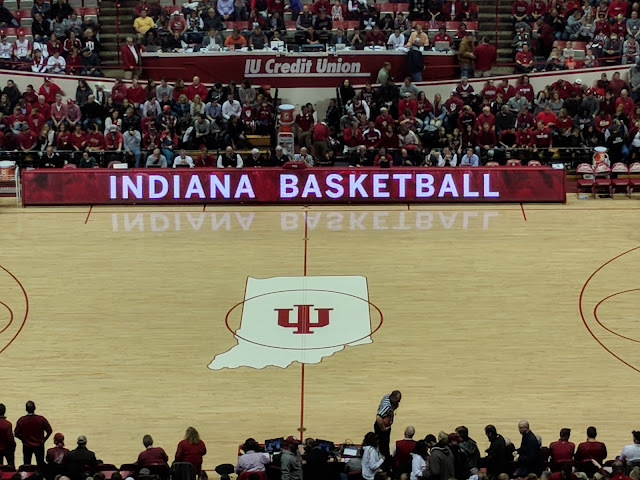 Unfortunately IU and DePauw don't have the same break, so Eric and I couldn't take a bigger trip like we usually do (we were able to get away for a couple of days at the end of the week, though!). While he is busy, I can find plenty of things to entertain myself with, and this week I found a few interesting places around town to explore. Beanblossom Bottoms boasts eagles, wetlands, forests, and all variety of birds, plants, and other wildlife. 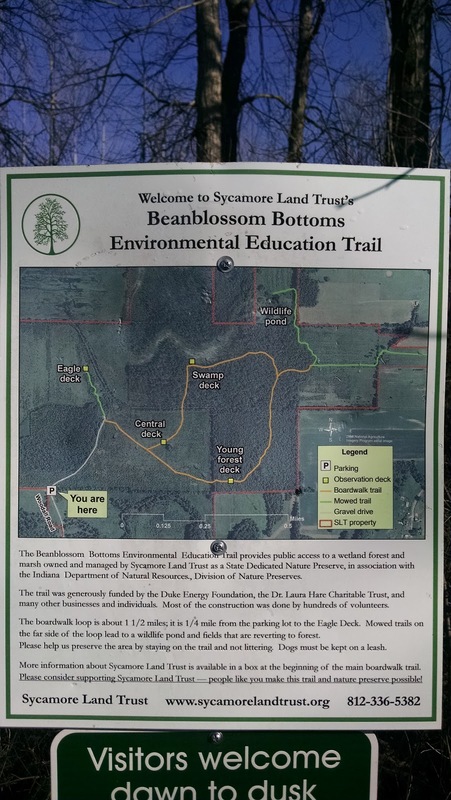 It is managed by the Sycamore Land Trust, and this was my first visit to property they manage. It was a great experience. There is plenty of information at the start of the trail. The first thing I always do before setting off on a hike is to take a photo of the map. I took this with my phone (easy to zoom in) and wound up referencing it several times during the morning. Much of the trail is on boardwalks, which made it really nice to walk. It didn't feel too much like a hike, but instead like a perusal of nature. There is a section right at the beginning that is mowed grass and some gravel. The gravel is loud and I tried to be very quiet so the animals would not run away. I was here in the morning and it was chilly (I had on a hat and gloves to go with a jacket and sweater). It had rained two days prior and the grass was wet from that and from the dew. I would recommend perhaps bringing a change of socks (or even shoes) to change into once you get through the grassy part, or wear good hiking shoes. Follow the mowed grass trail to the left (there is no marker) where you first come back to the boardwalk, and it will take you to the eagle nest overlook. There are several very well done overlooks throughout the preserve. I spent about 15-20 minutes on this one trying to find any signs of eagles. It was between about 10-10:30am so my timing may have been off, or there might not be any nesting here now. Head back the way you came in and take the boardwalk. I saw my first person (and dog) at this point (the only person I would see until the very end of the hike! it was wonderful), and the man asked if I had seen any eagles. He said he comes here often and hadn't seen any eagles since 2013. 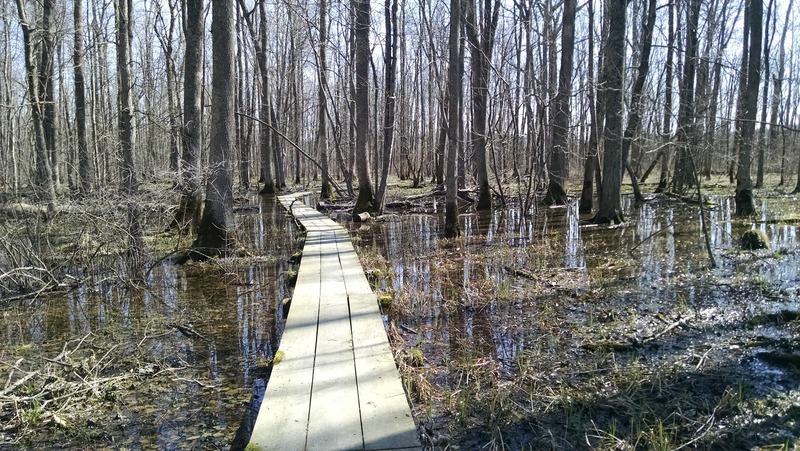 The boardwalk will lead you through the beginning of the wetlands. I intentionally decided to visit this preserve on the first day of spring because it has wetlands - and mosquitoes really love me. I have no idea how this hike would be in warmer weather, but it was 35-43 degrees F while I was here and it was great for me. Almost no bugs at all. 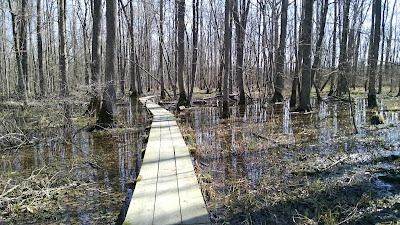 The boardwalk leads through wetlands and forests. I heard a chorus of different birds, most of which I can't identify (one skill I might like to acquire is to be able to identify birds and trees), although I did see a few red-headed woodpeckers. I also saw a few squirrels. The boardwalk is built well, although there are a few loose boards here and there, and even with the earlier rain nothing was flooded. It's a good space for one or maybe two people to walk (passing people gets a little tight). The map has an area with a marked trail to a woodland pond. I really wanted to go to the pond because that is where herons could be nesting. Unfortunately, this is where the boardwalk ends! The water was several inches deep all across and I couldn't find a good way to get to the trail, so the pond is the one area and trail I did not explore. I am happy to have found this nature preserve and may try my luck with it again in a few weeks to see if any flowers are blooming. Hopefully the mosquitoes will stay away a little while longer. 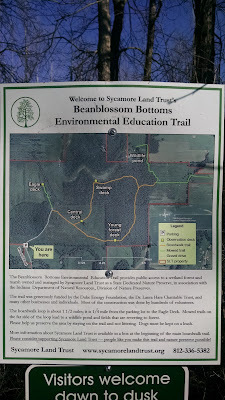 If you are looking for a very relaxing, peaceful walk through woods and wetlands just a few minutes outside of Bloomington, check out Beanblossom Bottoms Nature Preserve too and enjoy! This seems like a great trail with its forest and wetland. I hope you had fun on your hike. The tip about taking a picture of the map is great.